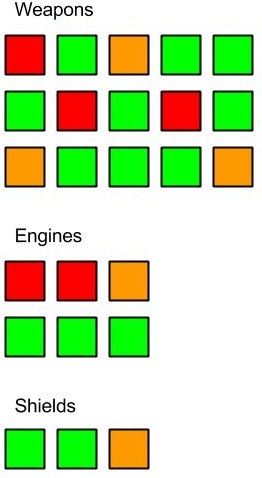 this first image shows the basic types of nodes. the core elements of all energy management. they create power that is then distributed along power lines. systems are everything that needs energy. they only have inputs for energy but outputs for "trigger" signals that go into capacitors. 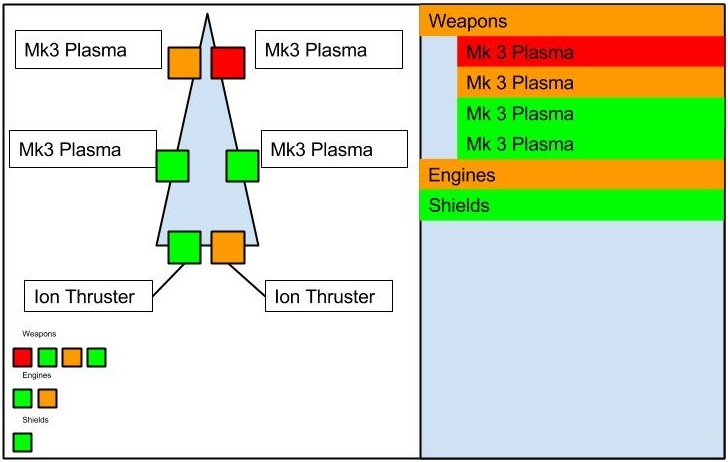 a weapon might cause its trigger signal when fired, a drive when the player presses the "afterburner" key, a shield when it gets below a treshhold etc. groups are "black box" constructs without any physical manifestation that just serve the purpose of making management easier. all systems are nodes in a graph. all nodes can receive and send out power along power lines. connectors are either input or output, so that the direction of energy/command flow is always defined between 2 connectors. when one drags a node over another one the dragged one gets added as "child" to the static node. causing all connections to go from the static to the dragged one. this makes setting up hierarchies very fast, as you just drag things onto each other. 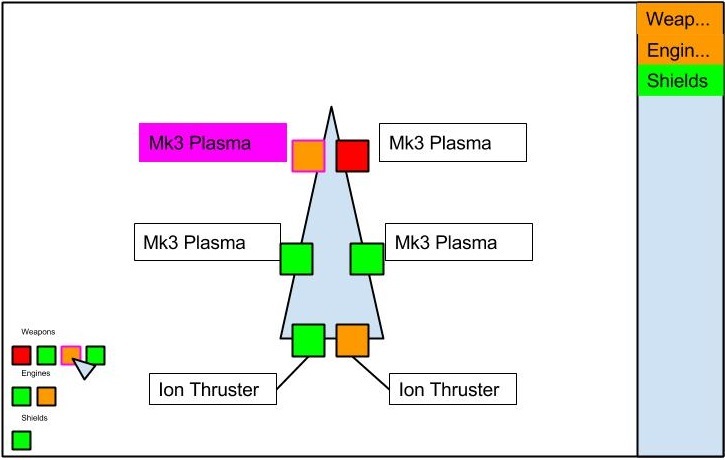 this shows a basic group structure. 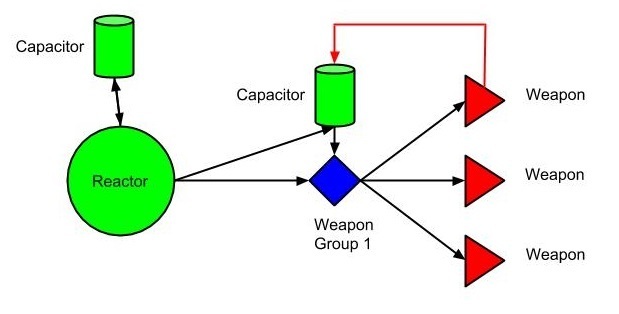 in this case weapon group 1-3.
if one of the super-groups gets more energy allocation, the sub-groups automatically get more energy. this can also be used for generating different subnets. 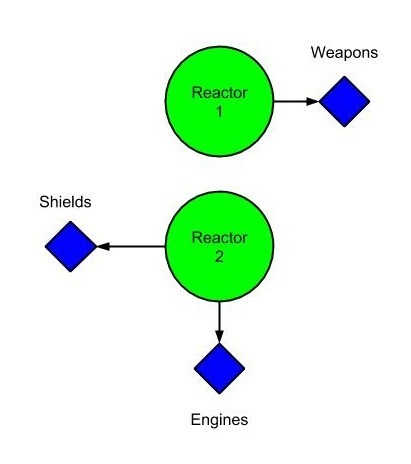 in this example weapons have an independent energy supply that is different from drive and shield supply. this is interesting for big military ships, which may mount multiple smaller generators instead of one bigger one. Last edited by Cornflakes_91 on Tue Aug 12, 2014 8:40 am, edited 1 time in total. 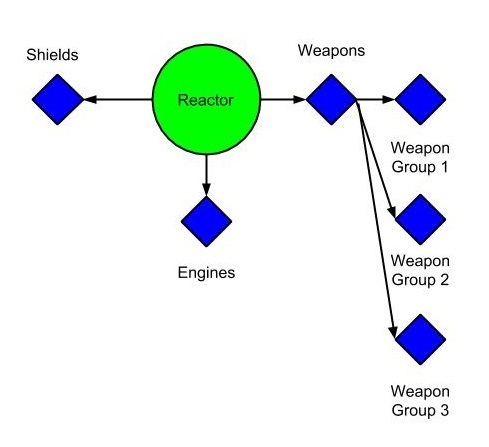 command / trigger signals can also be routed from group nodes to other group nodes or systems. 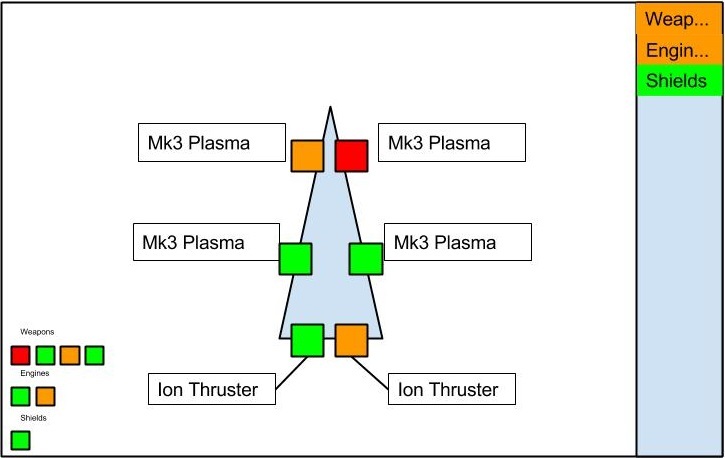 or multiple turret assemblies can be ordered from a single control node. so you might slave the control of a few turrets to good gunner NPC's and slave them to the command of a good commander, coordinating their fire. So, to put it in simpler terms so people like me can understand, this is a system that allows you to group things up so as to control a group of one thing as opposed to controlling one thing at a time? Idunno wrote: So, to put it in simpler terms so people like me can understand, this is a system that allows you to group things up so as to control a group of one thing as opposed to controlling one thing at a time? And it allows you to define from where systems get their energy and which way the energy takes to the systems. I like it. A way to group hardpoint controls in any way I like for various reasons and redundancies sounds great. How will the AI know what to do though? I'm with Hyperion on this one . It's a great idea . Hyperion wrote: How will the AI know what to do though? The AI would need a way of detemining energy allocations nevertheless, so it can still use its normal routines. For the trigger controlled caps it only needs to know where the energy ends up when it uses them. Which it would need to know already. So long as the reactors produce actual power, and the systems use actual power, I'll be happy. Down with magic energy teleported in from the aether! A ship is its own little micro economy, every action should have a power cost, paid for from the ships total power budget. CutterJohn wrote: Down with magic energy teleported in from the aether! A ship is its own little micro economy, every action should have a power cost, paid for from the ships total power budget. Now! The new and improved magic aether reactors! You ever run out of hydrogen on the way to alpha centauri and had to limp to the next overpriced fuel station? The new magic aether reactor uses a patented array of unicorn horns to turn the energy of child laughter into megawatts of electrical energy! never run out of power again with the magic aether reactor! Last edited by Cornflakes_91 on Sat Jul 05, 2014 11:35 am, edited 1 time in total. You convinced me to login and post from an iPhone. This idea is obviously superb. If you could edit the power through some kind of modular system that would be pretty cool. For example, I could use the reserve resources of the ship to install a new secondary reactor and capacitor that seperately fuels the left side of the ship, so that now the right side weapons don't steal the power of the left research part of my super carrier. I will clarify this if no one understands once I reach my computer..
Black--Snow wrote: You convinced me to login and post from an iPhone. This idea is obviously superb. i understand you and that was more or less the intention why i proposed this system. Just a thought on capacitors. I would love to see being able to route my energy into a capacitor, and release it all at once into my lazors when the target is locked. Capacitors when attached to lasers should in my opinion give out their maximum output rate until the capacitor is drained or the laser overheats. Also for an interesting weakness, if a highly charged capacitor is damaged, it might explode with all the force of the energy inside, perhaps blowing up the whole ship it was on. Hyperion wrote: Just a thought on capacitors. I would love to see being able to route my energy into a capacitor, and release it all at once into my lazors when the target is locked. for this are the "trigger" signals. Talvieno wrote: Let's say your weapons malfunction. This is important to know. Weapon jammed? Also important. Weapon destroyed? Very important. Shields idling at maximum? Important to conserve power, but not quite as important as your shields gone and armor failing. I suppose I should've said "critical". However... it's worth noting that if you have a large battleship with 100+ hardpoints, that's going to be an absolute pain to fit on the screen at once. The bigger the ship, the harder to pilot because the HUD becomes messier? No thank you. Piloting a larger ship might take some juggling, but the difficulty should be in the piloting, not in the HUD. if you have 100+ hardpoints its not that important which exact weapon failed. its pretty self explaining i guess. the single dots represent single systems and the color represents the status of the system. so you always have the amount of detail you need. Cornflakes_91 wrote: just recognised that i slightly missed the point ._. im thinking about the HUD with my above suggestion, not the full hardpoint view.